The ideal solution for the problem of the guitar edge! Antiallergic product, fabric: 92% cotton and 8% elastane. Has an internal splint (the pressure distributor), provided with holes in order to allow the skin to breathe, made of polyethylene and a layer of textured foam. Luva Hard with rigid support is provided with an inner piece called a pressure distributor, which is its essential part. The pressure distributor eliminates local pressure of the guitar edge against the forearm, distributing the pressure along almost all of the inner surface of the forearm. (The Luva Soft with soft support makes use of a rubber layer which allows a soft distribution of the arm pressure against the guitar edge). For the guitarists, who have a lot of arm pressure against the guitar edge, it is advisable to prefer the Luva Hard with rigid support. The Luva armpad can be easily handled and used unperceptively under the arm sleeve, if one wishes (for example, during performances). It is appropriate for right-handed as well as for left-handed guitarists. Offers comfort and protection during playing the guitar. The armpad eliminates local pressure on the forearm, improves the performance of the right hand. 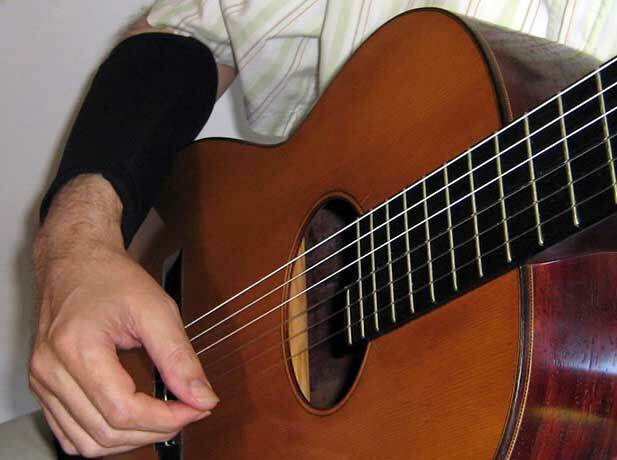 It allows a more efficient functioning of the guitarist's right arm and hand, which will become speedier and more secure, allowing more fluency in moving the fingers, resulting in less tension, a more relaxed right hand, less fatigue and greater playing ease. Medical Appliance: The use of the Luva armpad is highly recommended to avoid muscles and finger nerve compression, to prevent calloused tissue formation, maintaining muscular flexibility, and to help in the prevention of lesions, like tendonitis and dystonia.